Full HD 1080p resolution ensures the ultimate home cinema, while high colour brightness delivers vibrant image quality – whether it’s a blockbuster movie, live sporting event or videogame. With the included RF 3D glasses, the EH-TW9200W puts you right in the middle of the action. The Epson TW9200W features ISF certification for top video performance. And, it includes specific ISF picture memory modes, such as ISF Day and ISF Night, along with six other pre-named ISF memory modes and two additional modes. To prevent mis-adjustments that may inadvertently happen after installation and calibration, critical adjustments can be locked. 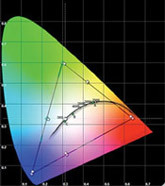 To assist with properly adjusting colour saturation and hue (tint) using SMPTE colour bar test patterns, the TW9200W makes it possible to turn off the Red and Green imaging pixels, leaving only Blue. This allows the user to make adjustments without needing a gel filter. A Red-only mode is also provided. Ensure accurate and exceptional picture quality – exceptional performance standards for black levels, resolution, contrast, colour gamut and signal processing. The TW9200W also includes a Versatile Movie Mode setting; a playback setting that lets consumers experience studio colour, black levels and clean-signal processing with few calibration adjustments. Enjoy thrilling 3D adventures right in the comfort of your living room. Featuring Bright 3D Drive technology, the TW8200 puts you right in the middle of the action. Epson’s drive system minimizes the blackout time of 3D glasses and provides greater brightness when viewing 3D content. There’s no need to worry about drilling holes, running cables or taking a lot of time for complicated software installations. Just plug your projector into a power source. The wireless receiver is built in, so you do not need to connect anything else. And, the wireless transmitter’s compact design allows it to blend into any environment. The Epson transmitter streams a Full HD signal wirelessly, so you can keep things tidy, and keep your A/V equipment separate from your projector. The Epson Wireless HDMI transmitter streams reliable, HD 1080p video, within the same room, at a distance of up to 10m. And, no Wi-Fi® network is required. It runs on a dedicated 60 GHz band. The system is HDCP compliant and can stream copy-protected content. Its fast signal transfer ensures real-time transmission of HD media. The wireless transmitter provides a secure connection that resists interference with nearby wireless routers. Connect your receiver, Blu-ray® player and game console, and stream devices like Roku®, Apple® TV, and more. You can even connect speakers via the optical connection. View a second device using the wireless Picture-in-picture Mode. Switch between up to five connected devices with the Preview Mode. The wireless transmitter connects to up to five HDMI devices simultaneously (including one MHL-enabled port), and has one HDMI out connection, and one optical port. Set up your A/V equipment once, connecting to both your projector and a second display device such as a TV. Whether you want to view content on your projector or your second device, you no longer need to unplug and re-plug in your devices. 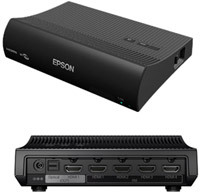 All you need to do is connect both devices to the Epson Wireless HDMI transmitter and then choose which display device you’d like to use. The Epson Wireless HDMI plug-and-play installation allows you to power up, connect, and start using connected devices immediately. You can even plug in your MHL-enabled devices and use the projector to display content from smartphones and tablets, including movies, games and more. Enjoy thrilling 3D adventures right in the comfort of your living room. Featuring Bright 3D Drive technology, the TW9200W puts you right in the middle of the action. Epson’s drive system minimizes the blackout time of 3D glasses and provides greater brightness when viewing 3D content. Transform any 2D movie, from the latest science-fiction adventure to your favourite classic, to spectacular 3D. Or, watch the big game in exciting 3D. The TW9200W makes it easier than ever with convenient 2D-to-3D conversion. With just the touch of a button, you can watch your favourite shows and movies in eye-popping 3D. There are no special discs required. And, the possibilities are endless. Epson Auto Iris technology adjusts the aperture toprovide optimum contrast and brightness for each scene.